mad orange fools: Anniversary dinner. The last couple of years, we seem to have fallen into a sort of ritual for our wedding anniversary. We get gussied up - this usually involves a new dress for me, although this year I didn't get to wear the new dress because the weather wasn't quite warm enough for such summery attire. I take a bunch of instant pictures of us looking good. And, the most important part, we go out and have a fabulous dinner. Love and food. Definitely the best parts. This year we decided to try Restaurant Martín, a relatively new restaurant that has gotten good reviews and is only a couple of blocks from our house. Oh, but wait, before I get to our dinner...this year a friend, Caline Welles, had an art opening at Marigold Arts so we stopped by there before dinner. Her drawings and poetry are so magical. It was awesome to finally see her work in person. Plus it was great to see her and Jono, both looking hot in purple. Anyway, back to dinner. 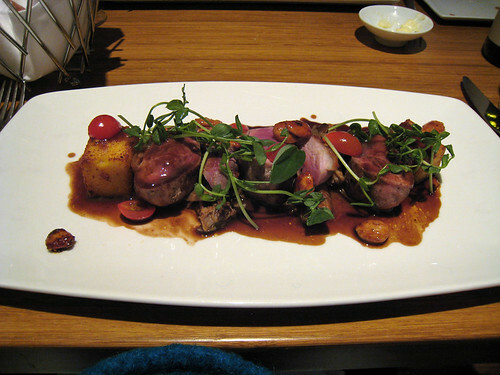 The atmosphere of the restaurant is unexciting, but whatever, that's not totally crucial to a good meal. (Of course last year's meal at Terra, sitting on the patio with a view of the mountains and watching the sunset...well, that was exceptional.) Our waitress was awesome which is always good, but especially good in a higher end restaurant. I think her name was Graciela. We couldn't decide on wine. Oftentimes I like to start with a white and move on to a red with dinner, but wine by the glass usually ends up adding up to more money than just getting a bottle. So we asked Graciela what she would recommend to go with our appetizer choices as well as the entrees. She recommended a Chilean Pinot Noir and I have to say, she was spot on. It was light and fruity enough to compliment the appetizer but not so light and fruity that it took away from the main course. Like I know what the hell I am talking about. Let's just say that the wine was good. We started off with the Roasted Organic Beet Salad with French Beans, Upland Cress, Marcona Almonds, Goat Cheese, Crispy Shallots. It was delicious. (I think I have Sheryl to thank for getting me into beets. The roasted beets with goat cheese that she and Rebby served one year won me over.) Fresh and colorful and light. Yum. Along with the beet salad, we had the Tempura Blue Point Oysters with Garlic-Parsnip Purée, Cucumber-Radish Salad, Fermented Black Bean-Chili Vinaigrette. They were good but not mind-blowing. We were torn between that dish, the Snake River Farm Pork Belly and the Wild Mushroom and Nantucket Bay Scallop Risotto. If we eat there again, I think we'll go for the pork belly. Next up, the entrees. 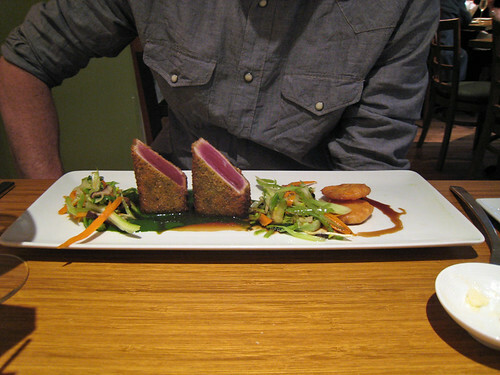 Will had the Spicy Crusted Ahi Tuna with Crispy Yams, Garlic-Spinach Purée, Stir Fry Vegetables, Soy-Red Wine Reduction. I had a bite of it and it was incredible. Really good tuna. As for me, I have to admit that one of the reasons that I wanted to try this place was because they have duck on the menu. I love me some good duck. And, in fact, I think I've had duck the past three years in a row on our anniversary. So yes, I like duck. I also like ducks, but I don't think about that when I am eating. I haven't had duck in quite some time since Rio Chama took it off the menu. Not many other places serve duck. Okay, so the duck. Maple Leaf Farms Duck Breast with Leg Confit, Smoked Bacon Polenta, Marcona Almonds, Brandied Blackberry Gastrique. I mean, come on, duck with bacon polenta? How could I not go there? It was really good. Fatty and rich and I love the confit. So good. We both had very happy bellies. Very full bellies. But that doesn't mean we skipped dessert. It was our anniversary after all. 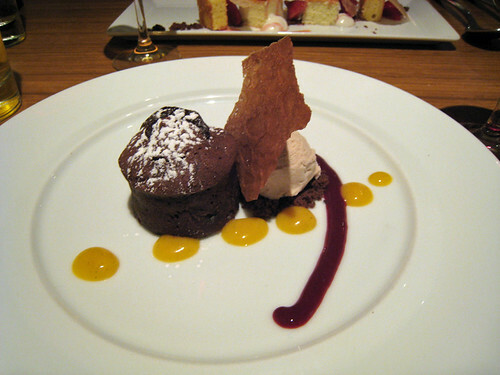 I've been really into red wine with chocolate lately so I was leaning toward a chocolate dessert. Granted our bottle of red was gone, but we figured we could order dessert drinks. I am not a big fan of dessert wines as they are usually way too sweet for me. But I figured our trusty waitress could give me a good recommendation. And she did. I don't remember the whole name of the wine, but it was some kind of Tawny wine that she said was not too sweet because something about brandy and the brandy cutting the sweetness. She said it would really bring out the flavor of the chocolate. She brought me a little glass to sample and I surprised myself by being able to drink it. So I went for it. Tawny wine and Bittersweet Truffle Cake with Pumpkinseed Crumble, Toasted Cinnamon Ice Cream. So good. Will went for the Mascarpone Cheesecake which isn't on the online menu and I don't recall the exact details of it, but he loved it. And Graciela recommended at Sauterne wine with it. 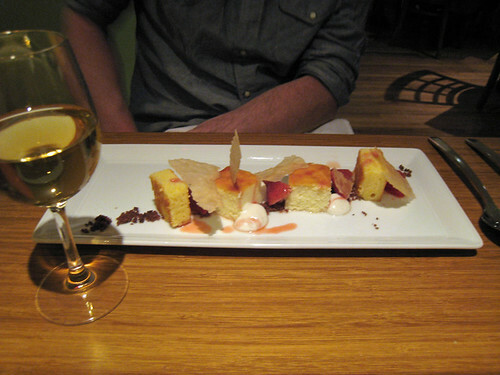 I tried the wine and it was way too sweet for me, although I imagine it did compliment the cheesecake quite well. I didn't actually try it because my palette was crazy with chocolate and Tawny. So we had quite the fabulous evening and I couldn't be more delighted with our life together. Will is the best. For the record, we both decided our meals at Terra last year and Mauka the year before were better than Martín. But Mauka is gone now and Terra is way more expensive so Martín is most definitely on our list of places to try again. It's way more exciting than our old fallback, Rio Chama.